I’ve started making a variety of Puff Pancakes Recipes. They make a wonderful presentation, but puff pancakes are also very easy to make for guests, so it definitely fits my prerequisite for Simple, Holiday Recipes. Straight out of the oven, you may show off the impressive puffed pancake since it will have risen 2-3 inches above the dish, and sprinkle it with powdered sugar. Yes, the pancake will “fall,” and then you can don it with your choice of fruit topping, sauce, whip cream or just pure maple syrup.One of my favorite additions lately has been peaches and you can find the Peach Puff Pancake recipe here. 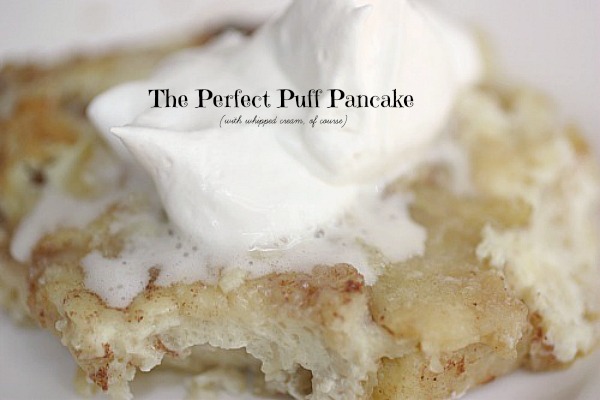 Summary: This Puff Pancake Recipe is as eye appealing as it is delicious. Easy to make with wholesome ingredients, it’s perfect for guests or groups. Blend the first six ingredients in blender or mix very well by hand. Meanwhile, melt the butter in a 9 inch round dish or fluted dish in the oven at 425 degrees. When butter begin to sizzle, but not brown, pour the mixed ingredients into the center of your dish. Bake for just 20 minutes. Enjoy our family staple of the Puffed Pancake. If you would like a slightly less “eggy” version, with a “no sugar” option, you may use only two eggs, and then completely omit the sugar and oil. All other directions are the same. In the next few weeks, I will share many other variations that we use, including fruit. I made this this morning exactly as you said except one egg less (like you said to do if you like it less eggy) it was GREAT! I think the only thing frustrating is waiting for the butter to melt in the hot oven and pan (which I know is important to make it bake right). My husband made swedish pancakes, which I don’t like at all…I showed him your recipe and he insisted on using one from an old cookbook which wasn’t the same. He totally flubbed it up using TABLESPOON measurements instead of teaspoon and his recipe called for baking powder which yours doesn’t. Why he questions me I don’t know, but any who he ate what was left of your puff pancake recipe. So good, easy and quick, I think I am making it tomorrow for Christmas breakfast but will double the recipe and make two pans. It’s a snowy morning here in Colorado. No school for the kids so I looked up this recipe this morning. Turned out GREAT! Thank you. I made this today to try it out with our gluten free flour and it turned out delish!! It tastes wonderful and we are going to do it again for sure. I think next time I am going to replace the oil with my home made apple butter. Thank you so much for sharing this. I made it with the apple butter and added 3 T instead of 2 because I love apple butter. It turned out good, the moisture was there but I will try adding some of the cinnamon into the batter next time so I will get more of the spiced flavor. Though the pictures of the peach puff pancake recipe are delicious looking, I was disappointed not to be able to access the recipe…..